During my final college years, I bought a couple pairs of those comfy (and trendy) jersey gaucho pants. I only got a couple uses out of them before the trend died out. And I didn’t have the height to make the pants look good. They are meant to hit below the knee and they almost touch my ankles. Even so, I have never given away the pants because the material was so soft. Last night I began to breath new life into the brown pair. I ripped out the crotch seam and part of the inseam to make the collar of a shirt. 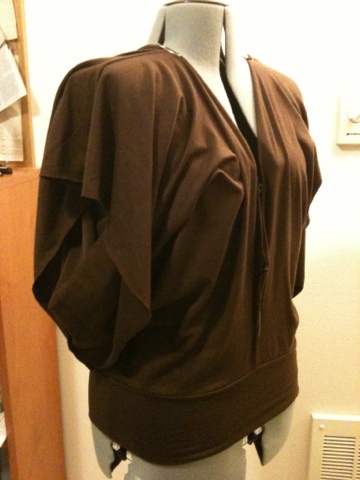 It needs some general structuring, particularly tightening up the side seams under the arms. And I want to do something with the front center seam (perhaps some ruching) to hide what used to be the crotch seam. Continue reading Part 2 of this fabric alchemy project. What a great idea! This shirt is so cute, I’d never know it was made from a pair of pants! Thank you. I am glad that I was able to find a use for these pants. I think I’ll be converting its gray twin into a skirt. This looks quite brilliant! I think I know the kind of fabric you mean, too, and I LOVE it. I’ve made myself a couple dresses of that sort of fabric, and it feels like running around in jammies all day. So comfy.